Shearwater, Freehold Communities’ master-planned community in St. Johns County, was meticulously designed to provide today’s homebuyers what they’re looking for, while encouraging a healthy lifestyle and connection to nature. This means that nearly every home includes either a front or back porch that extends the living space, giving each family more room and making it easier to spend time outdoors. Whether you’re a BBQ master, a hostess with the mostest or just enjoy watching the sunset, you’re sure to find the outdoor space that’s perfectly suited to you. Your private oasis is just one step out the door. With a front or back porch, or both, it’s never been easier to get a breath of fresh air, whether you prefer to have your morning coffee on the wraparound front porch with neighbors or an evening glass of wine in the quiet of the back patio. A small back lanai provides a cozy spot for afternoon naps or opt for a larger size to accommodate a table for meals alfresco. Plus, with the option to have your back porch covered, screened in or even include outdoor fans, you can enjoy the great outdoors all year long, rain or shine. Who says nature belongs outside? At Shearwater, some floor plans feature multi-slide or quadruple sliding doors that form a wall of windows in the living room, flooding the room with tons of natural light. Even better, some homes offer doors that collapse all the way back, opening up the room and creating a seamless transition from your living room to the great outdoors. Imagine hosting the block party of the year in your own backyard, enjoying a cool winter breeze through your whole home or having a romantic dinner under the stars. 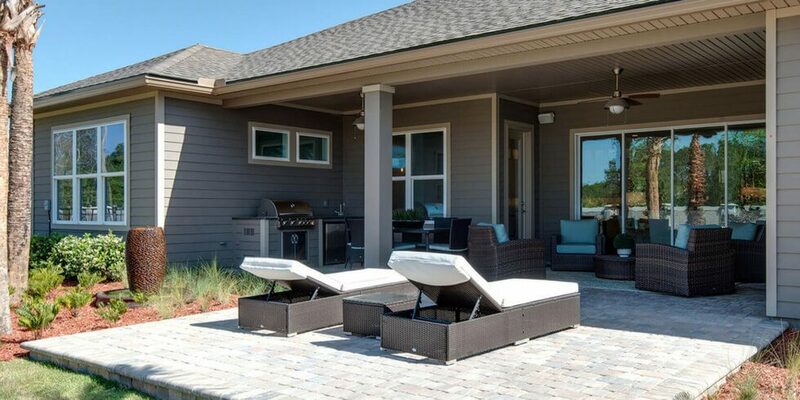 Shearwater’s home builders provide a wide range of options so each family can build their dream outdoor living space. Right off your covered lanai, include a pet room for your furry family members or even a pool bath so you don’t have to drip through the house to use the restroom while swimming. If you love to entertain, you can extend your lanai for extra space, transform it into an outdoor kitchen or include an outdoor fireplace. Some floor plans even have the option to include a balcony on the second story, providing the perfect place to cozy up with a good book and enjoy the breeze and wildlife. Come and discover everything that Shearwater has to offer. Model homes are open for tours seven days a week. And make sure to join our Interest List so you’ll always stay up-to-date on Shearwater news.